Our Atlanta Braves sure stunk it up this season in their new Cobb County stadium. It’s a good thing the county commissioners didn’t ask the citizens of Cobb to vote on the stadium because who knows if we would have approved spending hundreds of millions of dollars on this team. Politics aside, one thing we do get from Sun Trust Park is The Battery, a nice collection of restaurants and shops that would never have worked at Turner Field. It does work in the ‘burbs, though, and it gives Date Night many new places to check out. 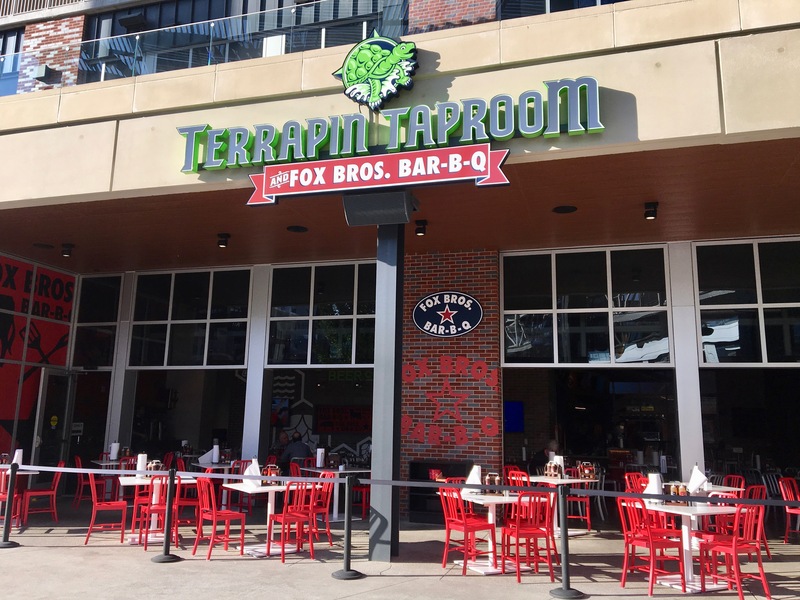 One of those places is the Terrapin Taproom, which happens to serve Fox Bros. barbecue. We tried unsuccessfully to eat at Fox Bros. downtown, but the crowds have kept us away. Good for them, but bad for us. Luckily, we can now get it much closer to home with a limited menu. Tonight, we are joined by “friends of the blog” Claudia and Randy, which means lots of laughs and more photo opportunities for us. 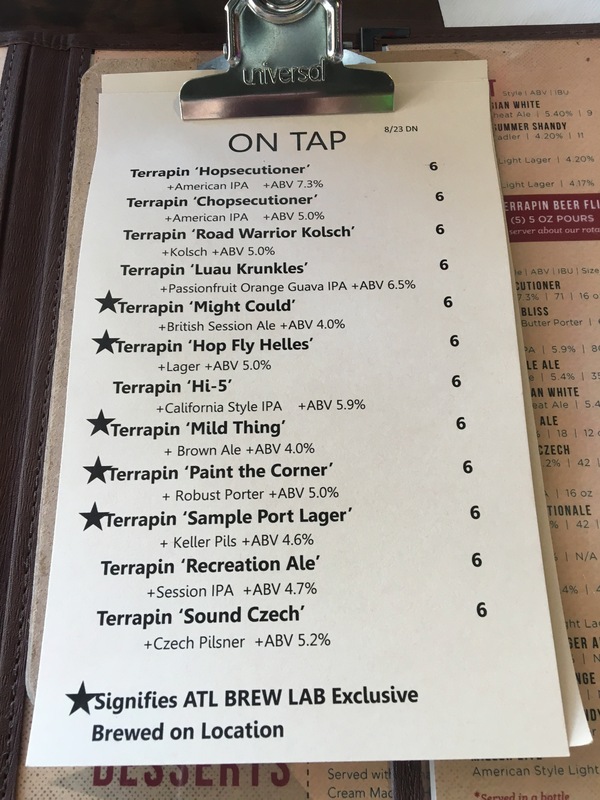 They sell Athens-based Terrapin’s biggest hits here, but they also make some special brews that you can’t get anywhere else. The stuff with the stars is the beer brewed here. 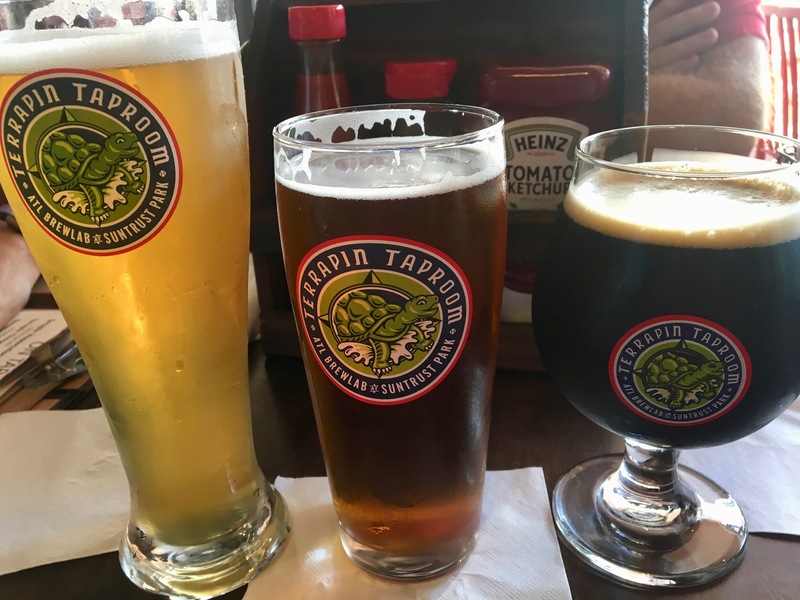 From left to right we have the Kolsch, the British session ale, and the porter. They are all enjoyable, and as I have seen in some beer blogs, “surprisingly drinkable”. All beer should be drinkable. Otherwise, you should drink water! 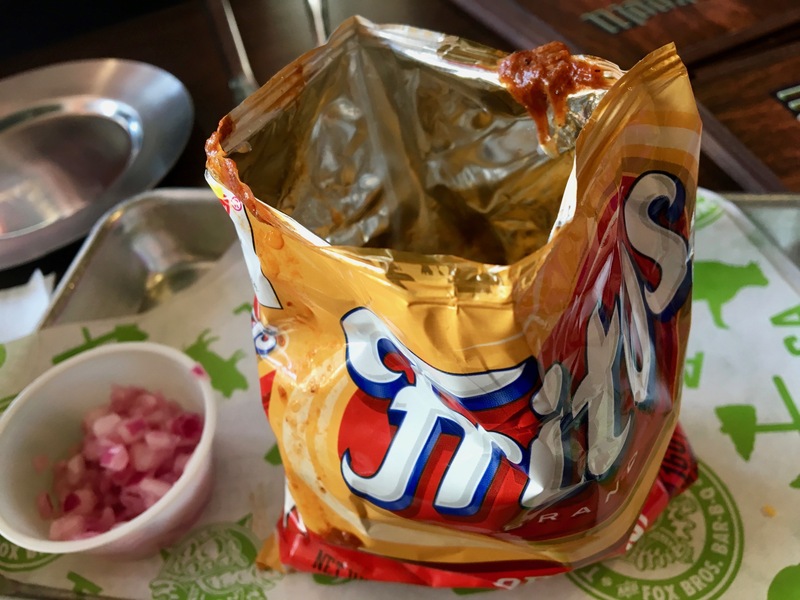 Open up the bag and it’s full of Fritos and brisket chili. And more cheese. Both dishes are good for sharing with your friends while you enjoy your beers. Eventually, we move on to main courses. You are here for beer and BBQ, and the menu has plenty of the latter. 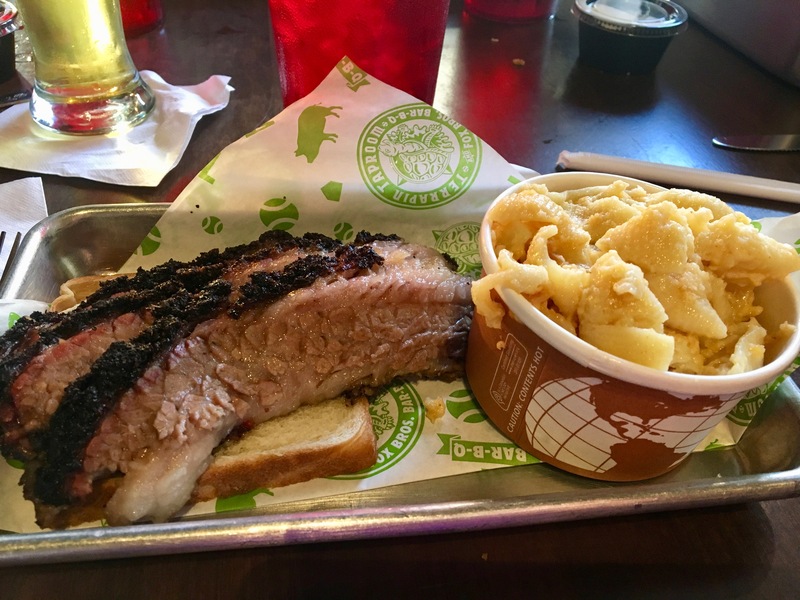 Unfortunately, there are no ribs here, but the brisket more than makes up for it. It’s moist with just the right amount of fat. The side of mac and cheese is wonderful. 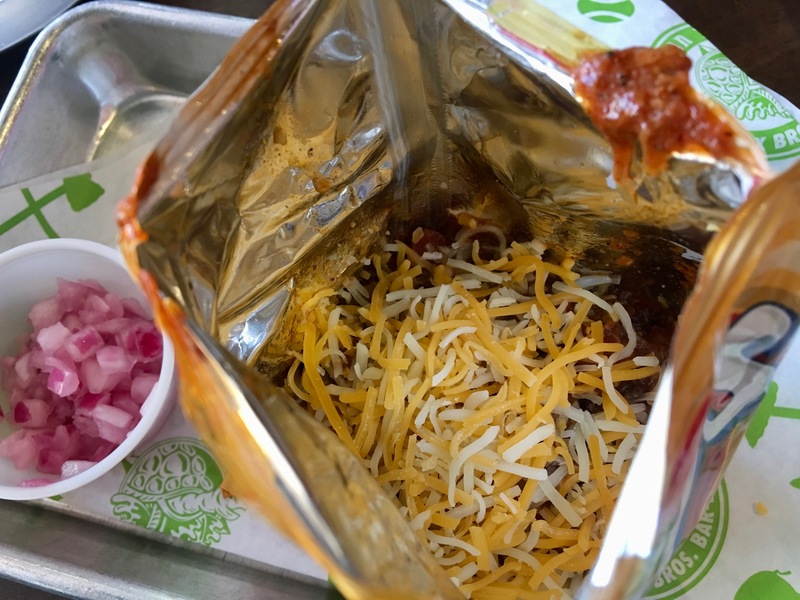 There’s not a lot of healthy stuff in my meal, but who orders green stuff at a BBQ joint? My date does, that’s who! 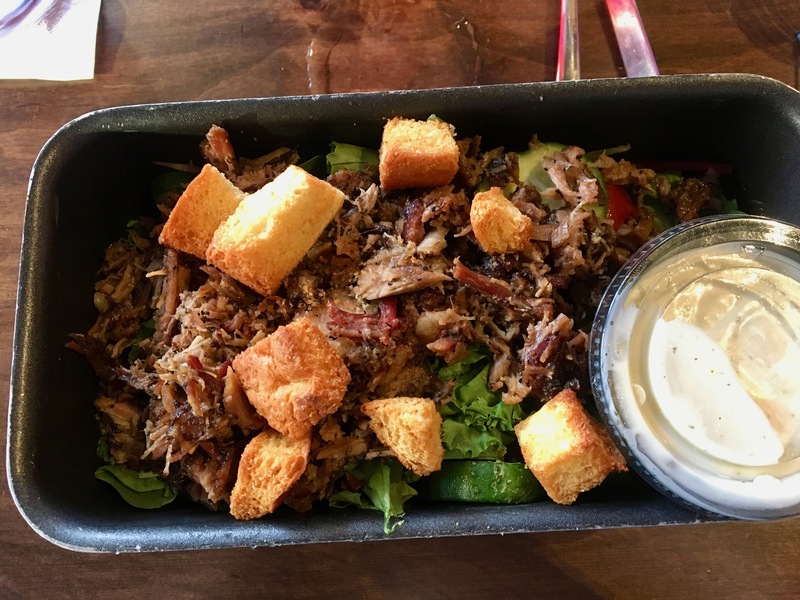 OK, it’s a salad, and it’s a good thing to order if you don’t want a lot of calories after those appetizers. 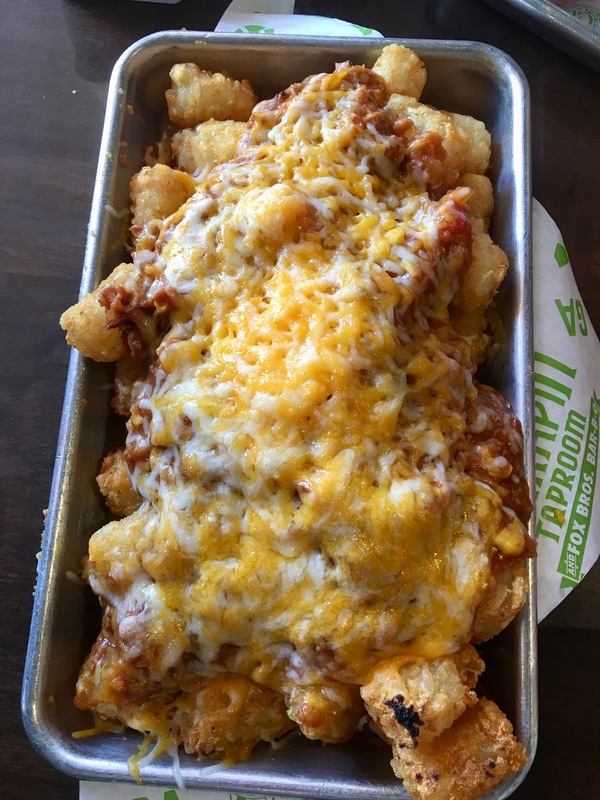 You can get pork or brisket on top. Eve and Claudia enjoy this guilt-free dinner. 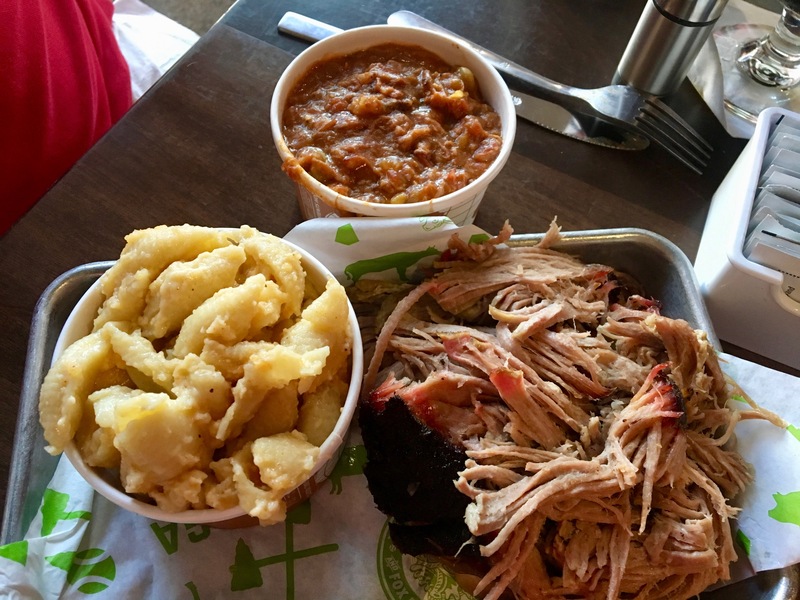 Randy goes for something more traditional, the pulled pork plate with mac and cheese and Brunswick stew. The pork is nice and moist and makes for a great picture. 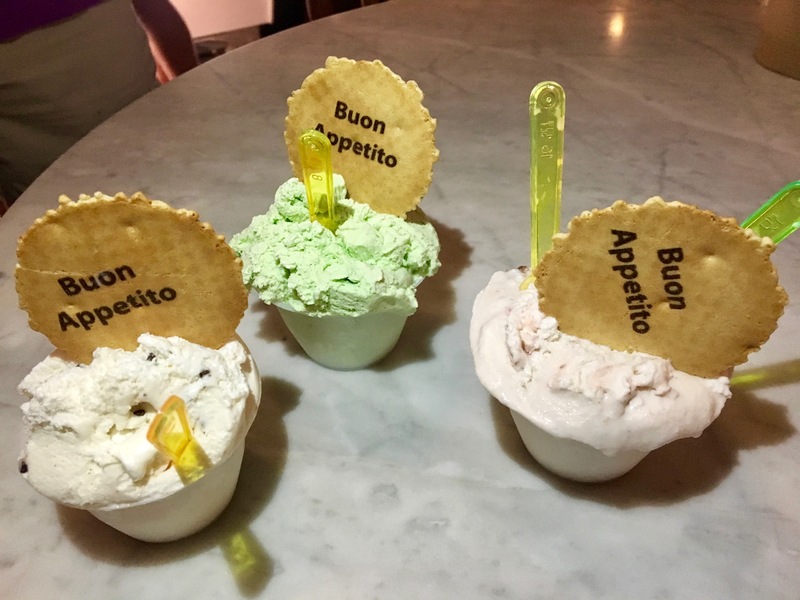 There’s dessert on the menu, but there’s gelato across the street. 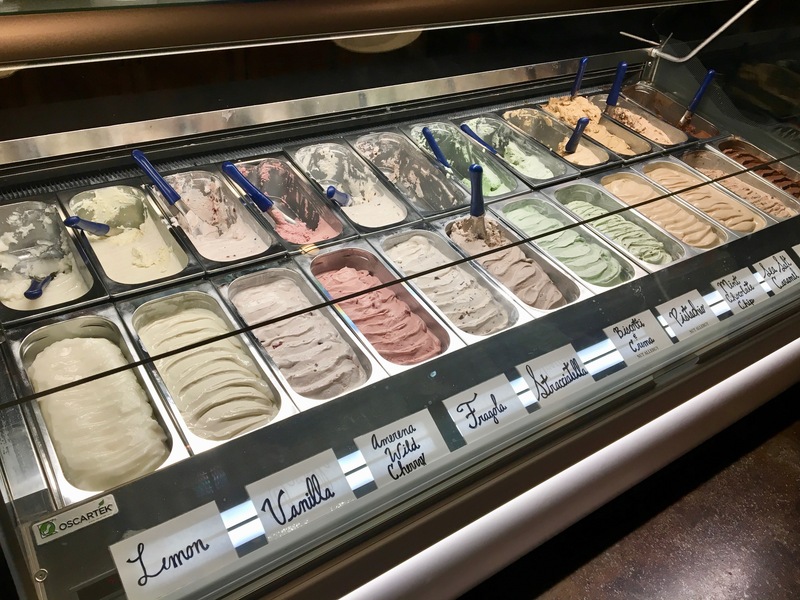 Here’s a tip: after your meal, mosey on over to Antico, where they have a full gelato bar. After all of that heavy barbecue, a heavenly scoop of Italy is just what you need. Buon appetito indeed! 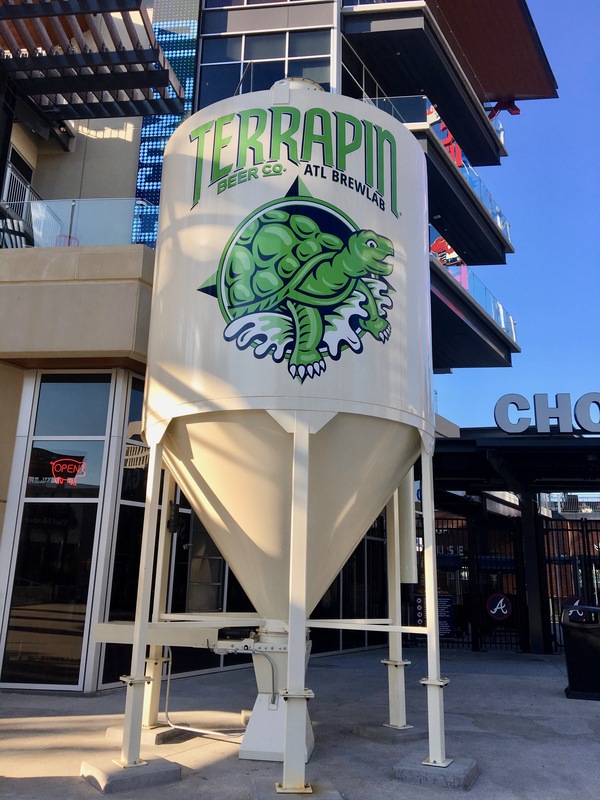 The Bottom Line on Terrapin and Fox Bros.: Someday, we will get downtown to sample “the real thing” as far as Fox Bros. goes. Until then, it’s much closer to go here for our “Fox fix”. Actually, we’ve got a place that’s closer, better, and has a better beer selection. We’ll go there in our next installment.